This month, we are excited to start a new phase of our work with Montana’s public health system. Beginning with a series of statewide listening sessions, we are conducting a needs assessment and feasibility study to determine whether the development of a public health institute would help address some of the key public health infrastructure needs in the state. Why are we investing in public health, you might ask? Even though many people associate physical health with personal visits to clinics and hospitals, public health departments are working behind the scenes to protect and improve the health of entire communities. Public health is responsible for controlling disease outbreaks; protecting air, water, and food quality; and developing and implementing strategies to combat leading health challenges. Moreover, countless studies show that investments in public health can return many dollars in savings on health care, social services, and other costs. Yet, across the U.S. public health receives only three percent of the dollars spent on health care and many small health departments face serious funding shortfalls. Our commitment to public health dates back to our first-ever grant in 2015: a $1.3 million grant through which we supported 34 county and tribal public health departments to convene community partners, identify key health challenges, and develop collaborative plans to address them. We’ve learned a lot about the needs in communities and the essential role that tribal, state, and county public health departments play in protecting and promoting health in Montana. We’ve also learned about some critical needs in Montana’s public health system. Montana has 7 tribal and 51 county public health departments, and many of those departments serve small, frontier communities with limited funding and staffing. In some counties, a single part-time employee may be tasked with providing all the core public health services needed in the community. 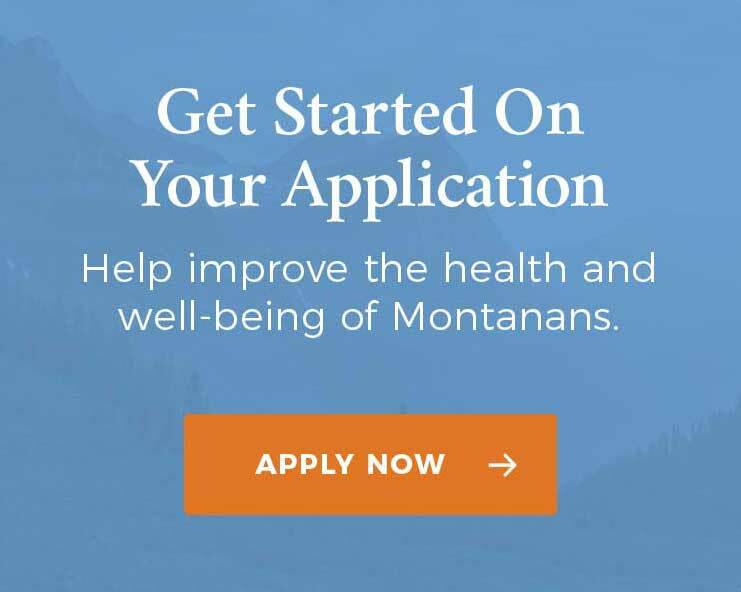 While Montana is fortunate to have outstanding non-profit professional organizations that support public health – including the Montana Public Health Association, the Association of Montana Public Health Officials, and the Montana Environmental Health Association – however, the funding available to support these organizations’ critical work has historically been limited. Increase the capacity of local public health agencies to meet community health needs through help with grant procurement, grant management, and securing long-term funds. Develop and implement effective programs to prevent prevalent illnesses, including substance use disorders, mental illness, and chronic medical illness. Create more opportunities for training and leadership development for public health professionals. Guide the development of policies that protect and promote the public’s health. Facilitate collaboration and sharing of expertise and resources among health departments. Across the U.S., more than 30 states have public health institutes that bring innovation, practical expertise, and an entrepreneurial spirit to the tasks of strengthening public health infrastructure and improving population health. 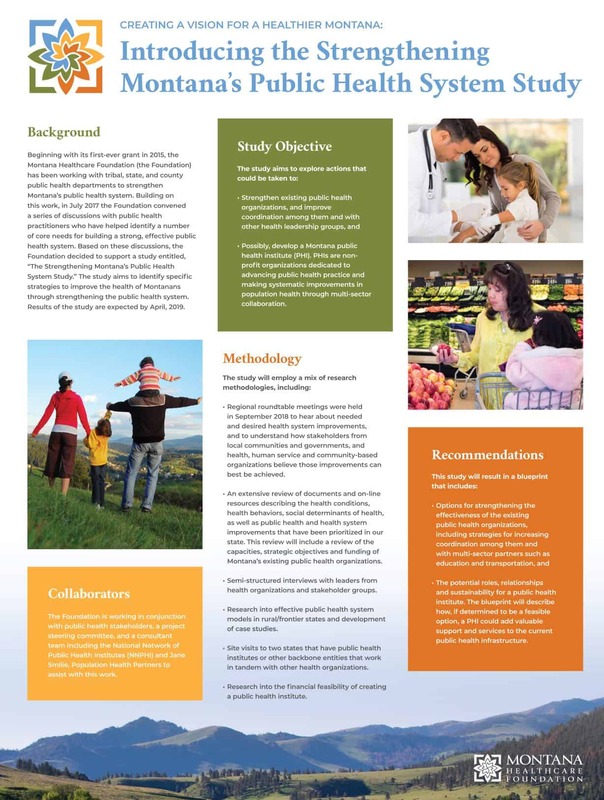 Over the course of the next year, we are excited to partner with the National Network of Public Health Institutes and partners throughout Montana to determine whether a public health institute might be a viable approach to addressing Montana’s public health needs.